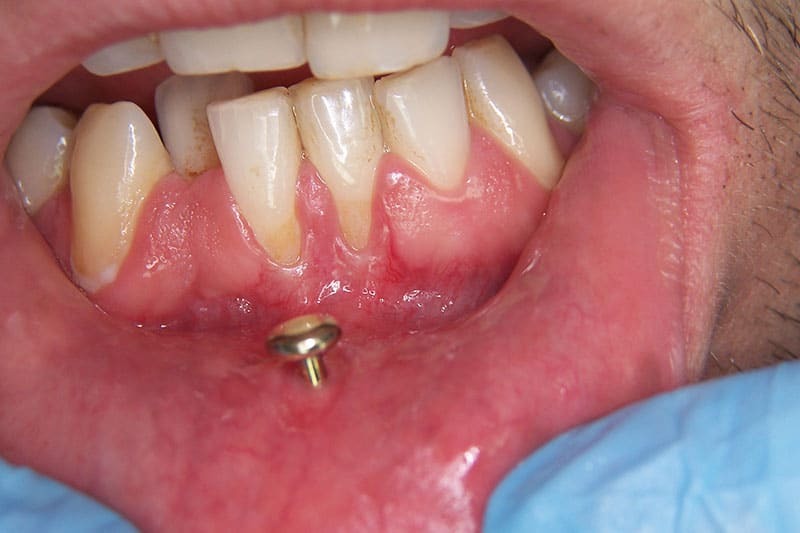 Severe Infection– The mouth has a substantial amount of bacteria which is worsened by oral piercings. The bacteria traps around and under the piercings. Piercings are the breeding grounds for bacteria. Prolonged Bleeding– Piercings can cause damage to the tongue’s blood vessels which can cause blood loss. Swelling and nerve damage– Because the tongue is in always in motion the healing process is long and drawn out. During the healing process it is customary to have swelling. The tongue has an abundance of nerves which can be very risky. If the nerves are damaged it is usually permanent. Bloodborne disease transmission– Oral piercings have been identified by the National Institute of Health as a possible factor in transmissions of hepatitis B, C, D, and G.
Deterioration of the gums and enamel– In some cases the placement of the oral piercings can have a negative effect on the gums and enamel. Constant contact with the gums can cause recession. Bulky metal piercings banging against the teeth can cause the teeth to chip which causes unnecessary repair expenses. The moral of the story is check out all the negative factors involved in oral piercings. Spread the word to your children and friends to help discourage them from making a mistake.